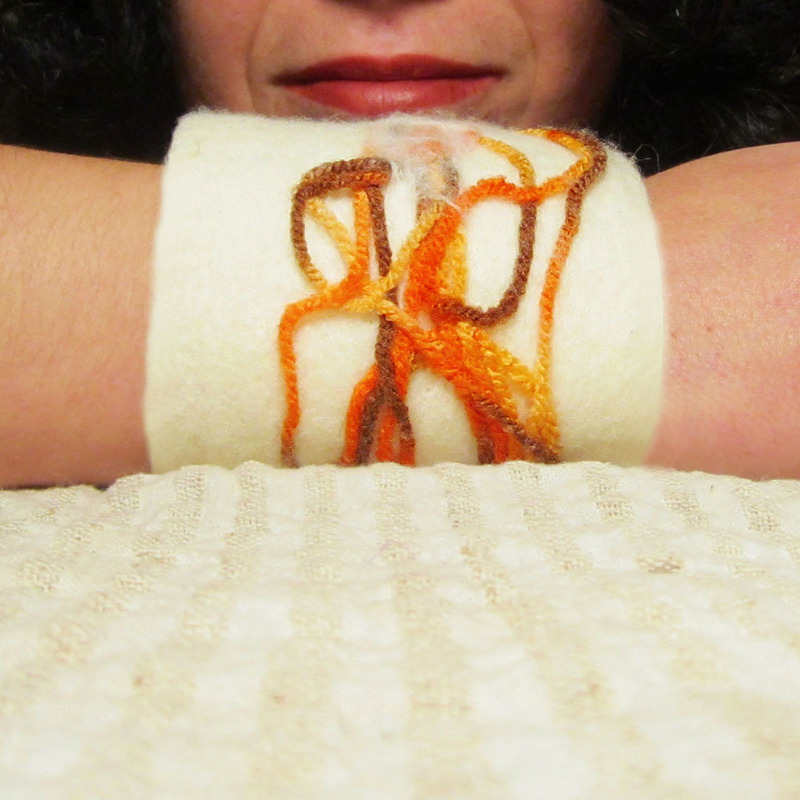 This light and airy cuff-bracelet is hand-felted especially for you who search for an outstanding and eco-friendly gift for a unique occasion and for your beloved ones. Make these unique moments handmade! 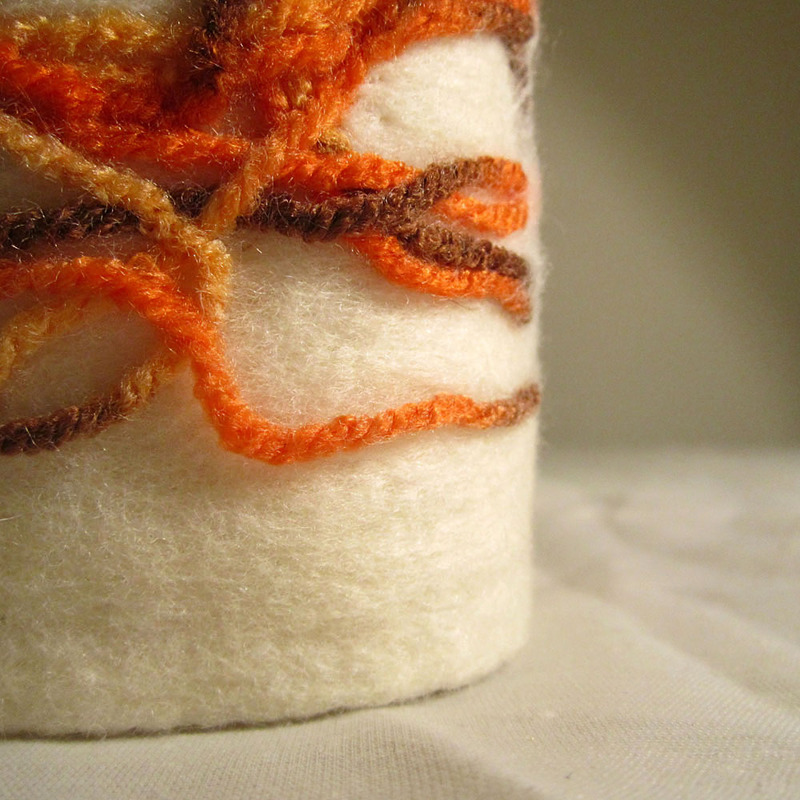 The cuff-bracelet is made of extra-fine merino wool from New Zealand and Australia in orange, yellow and grey colors. It measures approximately 7.5cm (3 in) diameter, 22 cm (8.7 in) inside circumference and width 8 cm (3.2 in). The widest part around the model’s hand is 23 (9.1 in) and her wrist is 17 cm (6.7 in). However the wool is stretchy and can fit over most women’s hands. An exceptional accessory to your casual outfit giving it a refreshing and stylish look! 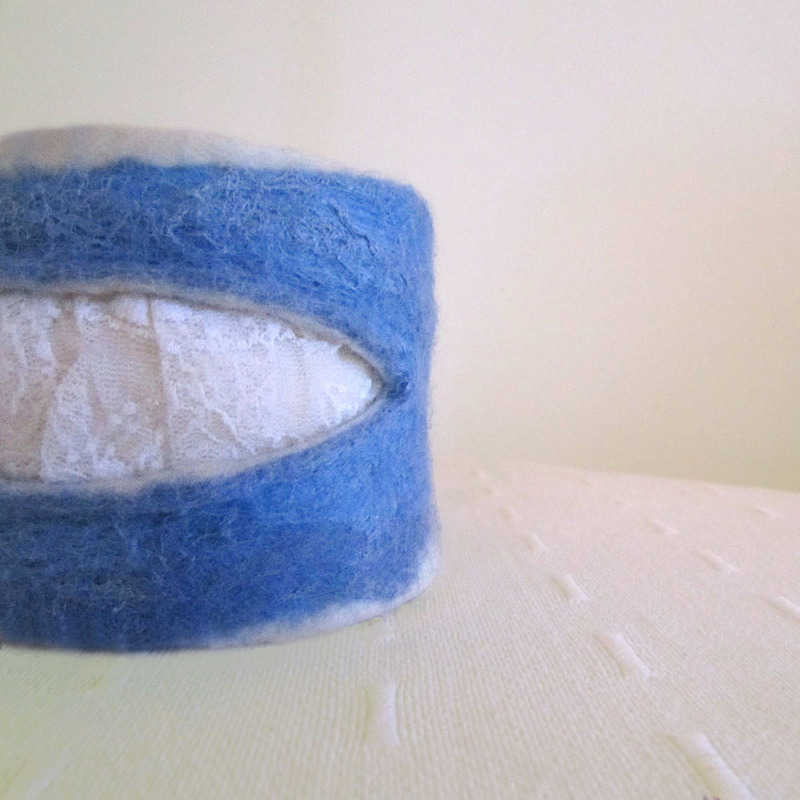 This cuff-bracelet is made of extra-fine merino wool (18 mic) from Australia in light blue color. Additionally extra fine mulberry silk fibers in light blue are used in order to offer a shiny effect which adopts azure and silver tints depending on the natural light. In the opening on the front of the cuff surfaces white lace in order to embellish it. It measures approximately 7.5 cm (3 in) diameter, 20.5 cm (8.1 in) inside circumference and width 8 cm (3.1 in). The widest part around the model’s hand is 23 (9.1 in) and her wrist is 17 cm (6.7 in). 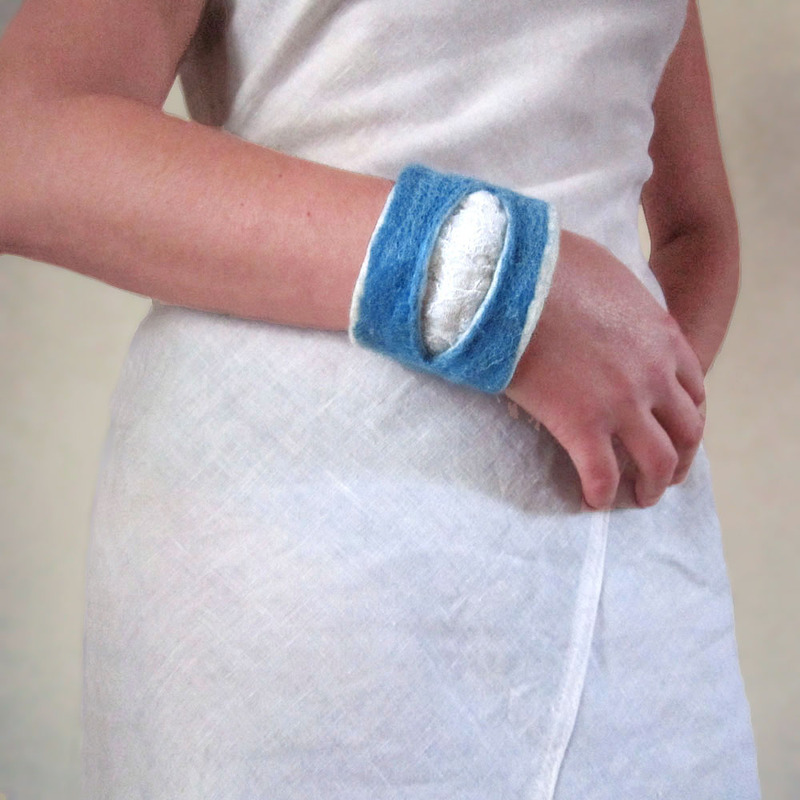 This cuff-bracelet is made of extra-fine merino wool from New Zealand in white color. 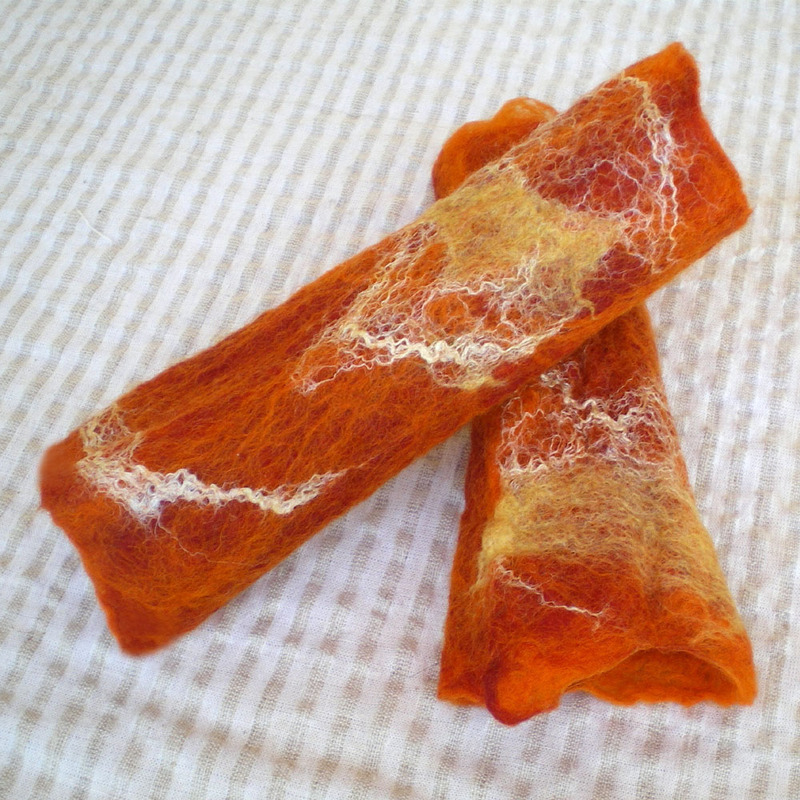 Additionally acrylic yarn in orange, yellow and brown colors is used in order to embellish it. The cuff measures approximately 8 cm (3.2 in) diameter, 21 cm (8.3 in) inside circumference and width 9.5 cm (3.7 in). The widest part around the model’s hand is 23 (9.1 in) and her wrist is 17 cm (6.7 in). However the wool is stretchy and can fit over most women’s hands. 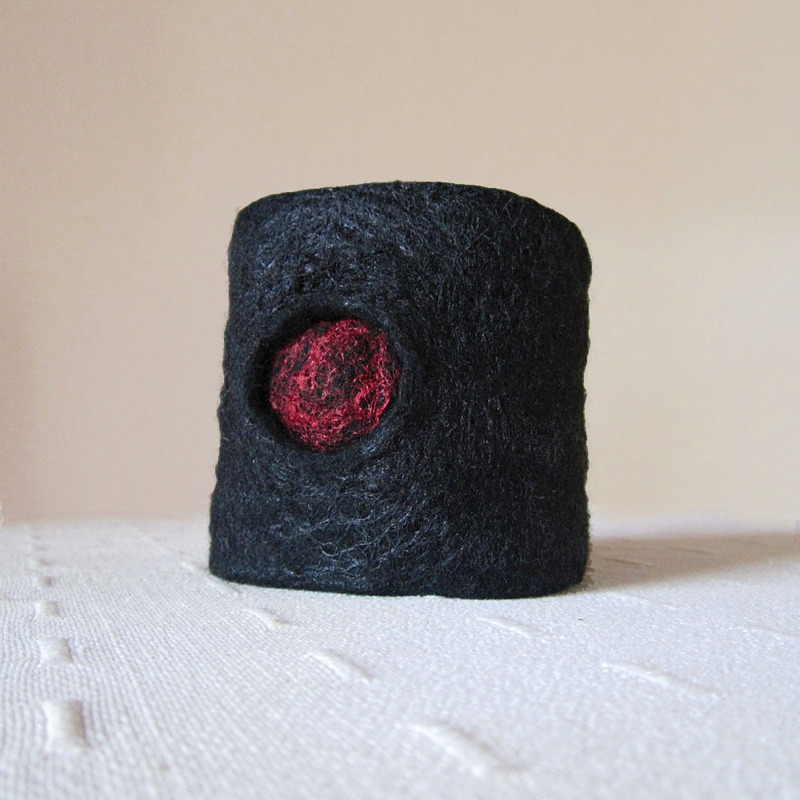 This light and stylish cuff-bracelet is hand-felted especially for you who search for an extraordinary and eco-friendly gift for a unique occasion and for your beloved ones. Make these unique moments handmade! 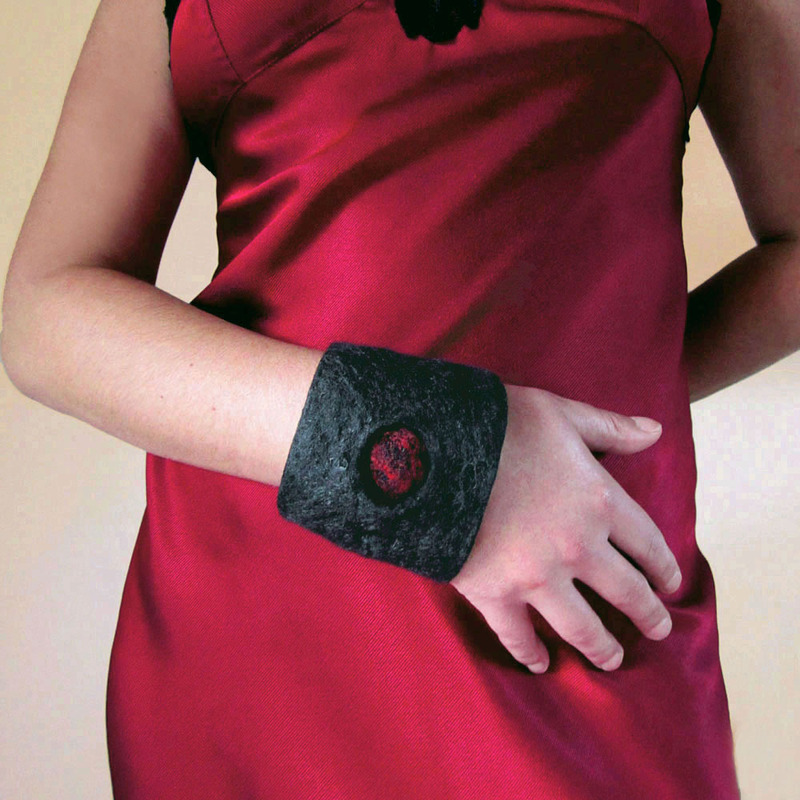 The cuff-bracelet is made of extra-fine merino wool from New Zealand in black and red colors. Additionally extra fine mulberry silk fibers in black and red are used in order to offer a shiny effect which adopts blue-black and grey tints depending on the natural light. It measures approximately 8 cm (3.2 in) diameter, 22 cm (8.7 in) inside circumference and width 8.5 cm (3.3 in). The widest part around the model’s hand is 23 (9.1 in) and her wrist is 17 cm (6.7 in). However the wool is stretchy and can fit over most women’s hands. 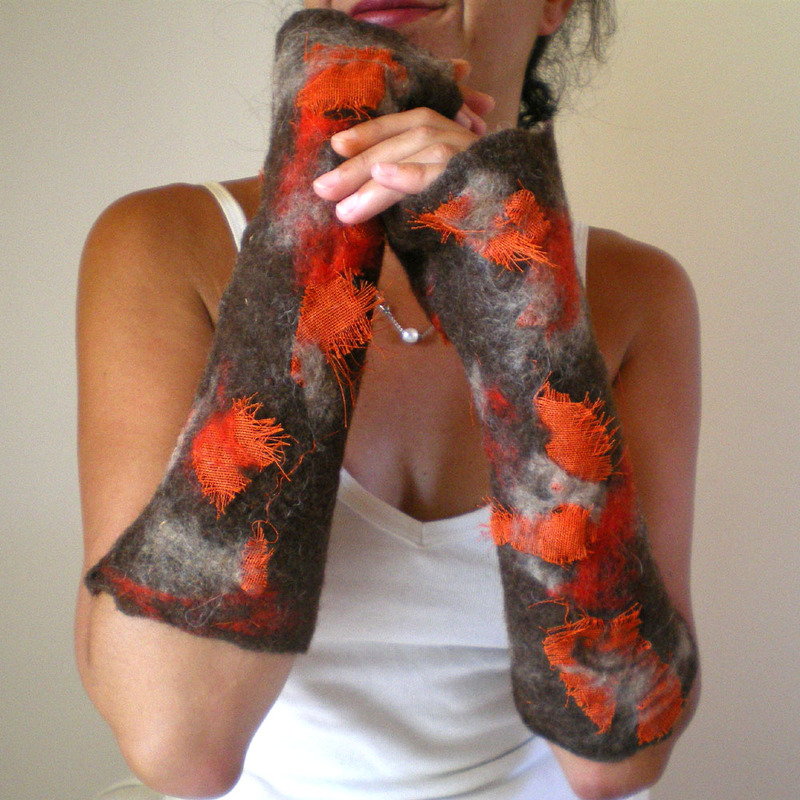 This pair of arm warmers is made of merino wool from Portugal (22 mic) in a warm, chestnut brown colour. In the arm warmers are also incorporated pieces of synthetic fabric with loose weave in orange-red colour, extra fine Australian merino wool in orange and Karakul-Merino wool in a natural light brown colour in order to create a rich palette of tones and unequal shapes and forms. They are felted all together using the wet felting technique and the result that you see in the photos is called nuno-felting. 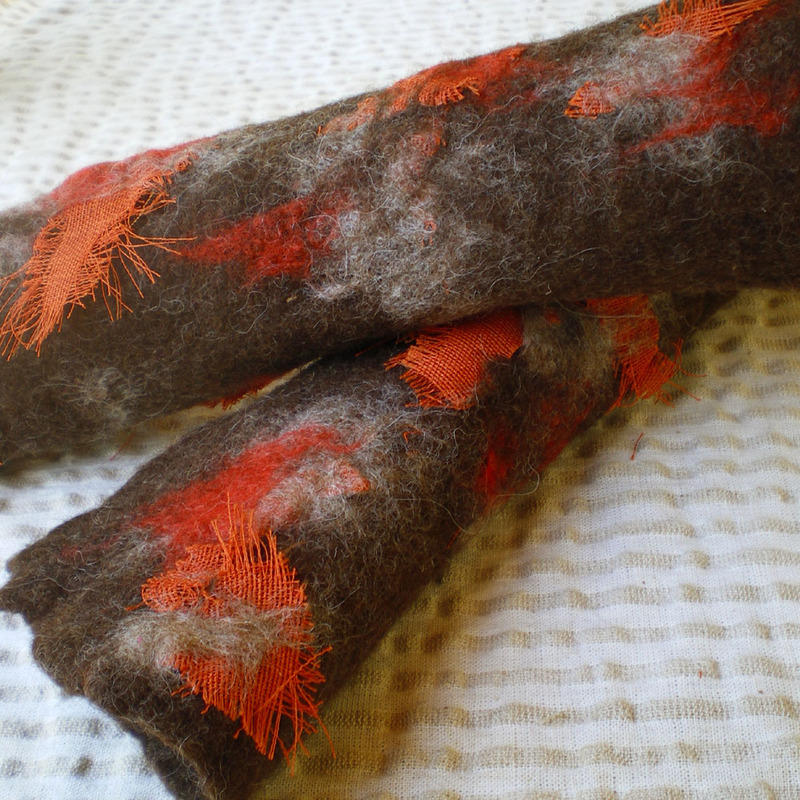 The distinction between this pair of nuno-felted arm warmers and a simple wet-felted item is that it contains also a different material except from wool, i.e. cotton and synthetic fabric. Their edges are uneven from both sides and they can be worn till the middle part of the hand as half gloves. On the other edge they reach the elbow. They measure approximately 30 cm (11.8in) length and 9.5 cm (3.7 in) width (flat). They fit most wrists however they can be reshaped (smaller or larger) with the use of warm water. 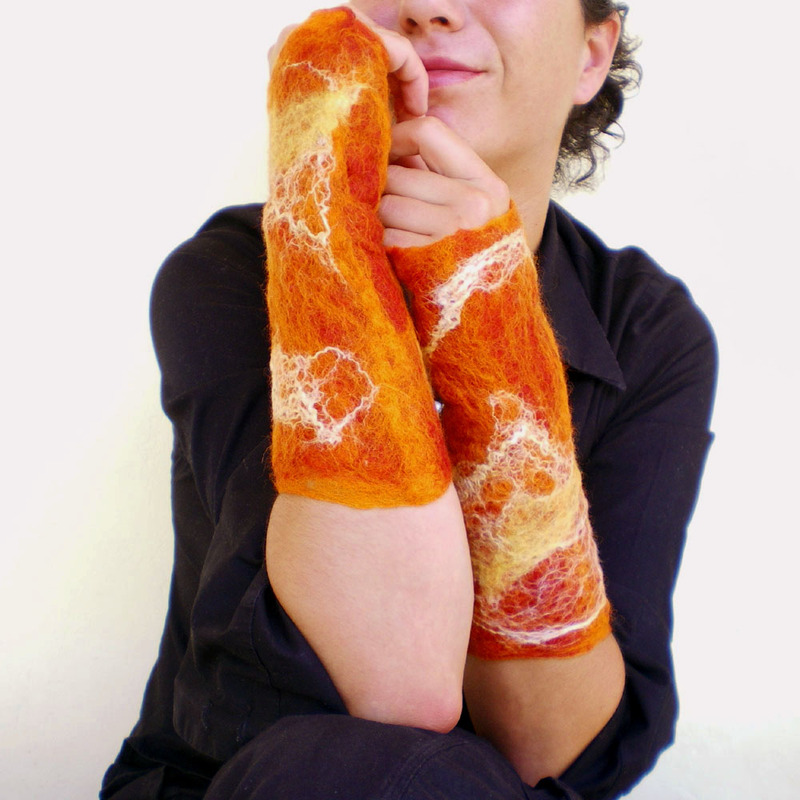 This pair of arm warmers is made of Australian and New Zealander extra-fine merino wool in orange, deep red, red and yellow colours. Additionally mulberry silk threads in blonde yellow are used to decorate them and to offer a shiny effect. Their edges are uneven and they can be worn inside out; one side covered with the patterning that you see on the photos and the other simply with green wool. They can be worn till the middle part of the hand as half gloves. They measure approximately 25 cm (9.8 in) length and 9 cm (3.5 in) width (flat). They fit most wrists however they can be reshaped (smaller or larger) with the use of warm water. Excelent!!!! I simply love them all!!! Congratulations!!! !